Open up Finder (Mac) or Computer (PC) and navigate to your hard drive. 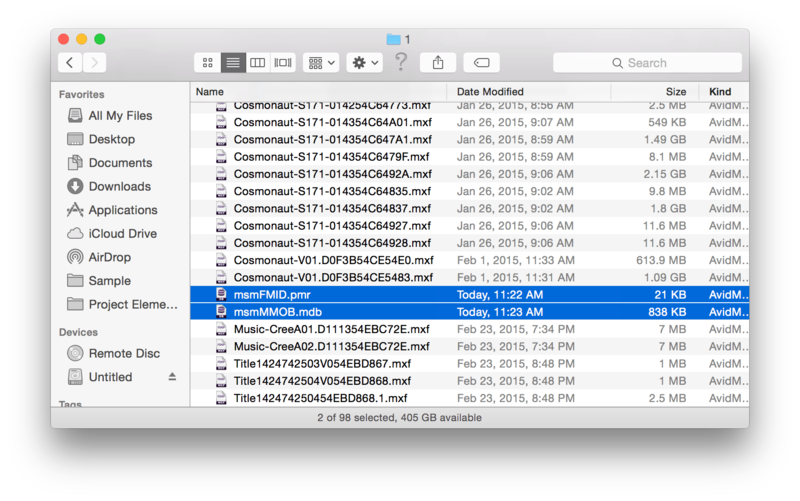 Find the Avid MediaFiles folder on the root (top) level. Open it up. Open up the MXF folder. Inside here you’ll see a folder named 1. There may be folders numbered 2, 3, etc. depending on how much media is in the folder. Inside the 1 folder you’ll find two files: msmMMOB.mdb and msmFMID.pmr. Delete them. Don’t worry, they automatically rebuild when you relaunch Media Composer. See picture below. Media Composer will re-index the media and doing so recreates the two database files when it boots up before you get to the Select Project window. Download this .pdf file that explains how to delete media databases from your storage drives allowing AVID to rebuild them. This is the first step one should take when media goes offline.